The USFS Visitor Information Center (VIC) is located approximately 2 miles southwest of Portal and 9 miles west of the Portal Road/Highway 80 intersection. Based on volunteer and staff availability, the VIC is open every day 9am – 3 pm. 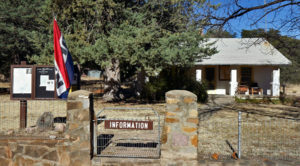 Constructed in the 1920s as a ranger station, the Visitor Information Center is a source for information about the canyon. Inside you will find a friendly ranger or volunteer who will answer all your questions, supply you with maps and brochures, and give you tips on the best places to go. 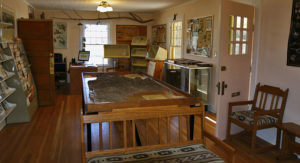 A screening room showing an informative 30-minute video about the Chiricahua Mountains, a large relief map of the Chiricahuas hand made by the Civilian Conservation Corps (CCC), and a rattlesnake display (summer only). The native species garden has labelled grasses, cacti, wildflowers, shrubs, and trees. You can also call (520) 558-2221 to speak with a volunteer. The Chiricahua Mountains make up a biologically diverse area that comprises numerous ‘sky islands.’ Five of the 9 defined life zones are found in the Chiricahua Mountains. Others have seen approximately 370 species of birds (including 12 species of hummingbirds in summer), 170 kinds of butterflies, hundreds of plant species and over 20 varieties of mammals including ocelots, peccary, mountain lions, coati, black bear, ringtail, and white-tailed deer. Species lists for birds, mammals, amphibians, reptiles and invertebrates can be found on the website of the Southwestern Research Station. Approximately 370 species of birds have been documented in Cave Creek Canyon, including 12 species of hummingbirds in the summertime. A checklist of the 100 most common bird species in the nearby Chiricahua National Monument is available on their website. Resources about local birding guides, birding books and natural history information, are available on the Cave Creek Ranch website. The American Museum of Natural History operates its famous Southwestern Research Station in the canyon about 4 miles from the Visitor Information Center. Scientists come from all over the world to study the area’s unique reptiles, amphibians, insects, plants, mammals, and birds. There are public hummingbird feeders and wetlands. The laboratories are not open to the public. Southwestern Research Station, located in the canyon at the confluence of the Middle Fork and North Fork of Cave Creek, has a small gift shop. It is open March – October on Wednesday – Saturday from 8:00am to 12:00pm and 1:00pm to 5:00pm. The gift shop is closed Sunday – Tuesday. The local community in the Cave Creek Canyon area sponsors many activities and organizations, which are described on the Portal/Rodeo website. Visitors are welcome to learn about the area and participate in activities that interest them. The Forest Service Website also has information about group campgrounds and rentals of the recently restored Portal Bunkhouse and Portal CCC House. Check the Hiking page for more information on hiking in the Cave Creek Canyon area and the greater Chiricahua Mountains.